With summer already here, pet owners are looking for ways to not only enjoy the refreshing water themselves, but allow their dogs to cool and exercise while swimming. But when it comes to swimming for dogs, safety is a serious concern, and the best dog ramps for water can assist pets with getting into and out of the pools or boats. Dog water ramps aren't necessary in most cases, and there must be a specific reason to buy one. For example, considering the costs of some of the best dog water ramps and the prices of the best dog pools, it might just make sense to opt for a pool for your dog instead of buying a ramp for your current pool. * Click on the water dog ramp to get more information and prices. Alternatively, scroll down below for more details and overview. What are the Best Dog Ramps for Water? This doggy water ramp comes in the colors of gray and khaki. It measures seventy inches long by seventeen inches wide, so that’s almost six feet in length. It can be used at the pool, as well as with furniture, cars, staircases, vet tables, and pretty much anywhere your little bud needs a boost. The ramp folds in half and is portable for easy transport. The walking surface is rubberized and won’t be uncomfortable against your pet’s paws; there’s no splintering wood or sandpapery feel. The surface is also easy to clean. To use, you unfold it and prop one end at the top of what you’re leading down from, and the other end should go on the ground—very straightforward. The ramp might seem a little pricey (average cost at $189.95), but it is high quality and has great traction, even when it’s raining or wet from the pool. Since you’ll be using this around water, the traction is a must-have. It is also very convenient, and isn’t this giant contraption that is impossible to use. Folded in half, it measures a little less than three feet in length, so it’s not unbearable to tote around if need be. Customers were pleased with the sturdiness of the ramp and how easy to use it was. The padded rubber was soft on dogs’ feet too, and if you have an older dog that is in pain, that soft surface is a definite bonus. Though this ladder is for boats, it can also be used to the pool. It’s bright yellow and consists of steps with no space in the middle. It is a solid staircase with no slats. It is portable and durable, but isn’t too heavy that it is impossible to carry. The design is rubber and is ribbed, so that it is slip-resistant. Because the material is rubberized, it is rust-proof and is coated so as not to get bleached-out by the sun. The grip is universal and works with all boats. It attaches to the boat’s human ladder. Human ladders that are over fourteen inches wide will require you to attach the extension piece to them. This is second of the best dog ramps for water because, although the surface on this is great, it is not as wide as the first one and some people with wider human ladders found the extension attachment to be cumbersome. This ladder is NOT made for large dogs, as several customers with dogs over 90 pounds pointed out. They had issues with their dogs’ legs slipping off and not fitting. It is for smaller or medium sized breeds, as the ladder itself is lightweight and isn’t meant for colossal dogs. Pet owners who purchased this ladder for their dogs for the pool, not the boat, had way more success, as they found that it was able to attach with no problem and provided a ribbed surface that would ensure that their dogs didn’t fall down and off into the water. This pet platform makes getting in and out of the water faster and simpler for your pet. It works for boats or for pools. This platform is made of lightweight, yet sturdy, aluminum and is powder coated to prevent corrosion or rust. The platform is 20 inches long and fourteen inches wide and is seven pounds in weight, making it useful for smaller breeds of dog, length-wise. The platform has traction ridges on its surface to make sure that your dog has even footing while walking on it. There are security straps that are diagonally linked from the platform to the lift’s frame in order to safeguard against the platform falling down. In order to operate, your boat needs to have a boarding ladder (so most boats). Connect that to the boarding ladder and it is ready to go. This ramp is $150.00 at the seller price. This water dog ramp is third one of the best dog ramps for water because it is size-impaired. The lift is less than two feet long, and owners with larger dogs (length-wise) aren’t going to be able to use it for their pups, something that purchasers found frustrating. It can’t support the weight that the ramp we listed first can, and that weight limit was detrimental on the rest of the ramp’s quality. It is designed to hang on the rung of a ladder, though some customers found that the narrowness of the platform—two feet—didn’t always fit the ladder that they were accustomed to on their boat. Customers who didn’t experience those issues were satisfied with the quality and found that it was easy to set up. Surprisingly, dogs that were shorter in length but heavier were able to fit on. Despite the ramp’s seemingly light weight (seven pounds), it actually did okay with dogs up to one hundred pounds. The security straps are not flimsy and hold the platform very well. Note that you cannot use the ladder while this is attached. Though this may seem obvious, some customers were surprised by that fact. There was another problem with the mounting system that was explained by several customers. The J-hooks that were provided to mount the platform onto the ladder came out too easily, something that frustrated several customers. Though this is experience was by no means universal, it is something worth mentioning. This ladder is one-size fits all and is a little different than the ladders we’ve previously shown you. This consists of three steps, all large, with no slats in the middle. The steps are to be screw-driven into the side of your pool, so you need to make sure you have a screwdriver and pins handy for the job. The steps go into the water and are made of material that is able to be submerged and is resistant to UV rays and chlorine—it’s a form of acrylonitrile butadiene styrene plastic, which is a low-cost, heavy duty material. The ladder is removable; you remove the two pins that you screwed in and then the ladder can be stored away for winter or cleaning, which is convenient. This ladder is usable for dogs that are between 4 and 150 pounds. The first step (the lowest one) is 14.5” deep, the second 8.5”, and the third is 5” (the step at the top). So, smaller dogs may need a little assistance getting in and out if they can’t maneuver the bottom step’s depth. The step works for in-ground and above-ground pools. This is fourth of the best dog ramps for water because the installation does take some work. It isn’t like the other ramps that you can just unsnap and set out. This one does require you to screw in two pins to hold the top step steady. The height of the steps is non-adjustable and the depth of the third step might be a little difficult for smaller dogs to manage, though by that time they’re pretty much in the water. The steps have a texture that is ribbed, so it doesn’t get slippery easily the way a flat surface does. This step is not for a dock; people who tried it (though it was labeled as not for docks) failed, so if your plan was to get this and engineer it to fit your boat, you’re better off going with one of the other ramps we’ve listed. 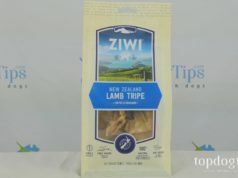 The steps’ ability to support even giant dogs made it great for owners with large pets who otherwise would have struggled to locate a piece of equipment to adequately fit their mammoth animal. You may also want to replace the screws in the steps, as they are plastic and are, according to a few customers, not durable for use several times a day, every day. It might make more sense to either reapply them with sturdy glue or replace them with metal. This ramp has a non-slip rubber surface that is ridged for traction. Unfolded, it has a 24 inch length, a 14 inch width, and a thickness of two and a half inches. It weighs 6 pounds. This ramp can support most dogs and people. It is good for water because it floats and is made of plastic with a rubberized surface. The plastic is easy to clean and won’t corrode or become rusted. It washes with soap and water. The handles on the sides are ergonomic, meaning that they’ll be comfortable for you to hold and handle. Snapped in half, the pet ramp is easily portable and measures less than three feet in length and should store easily enough. This ramp is also workable for locations other than the pool, such as truck beds, cars, boats, and pretty much anywhere you might need a ramp for your dog. This is fifth of the best dog ramps for water because it is clunkier than the above models. However, it's cheaper. It weighs 6 pounds instead of 7-18 pounds that others do, and for some owners that is inconvenient. However, most were pleased with this ramp, and owners with dogs that suffered from arthritis or osteoporosis were relieved that this ramp could be accommodated anywhere for just about anything. They didn’t have to struggle with it. Customers said to be very careful how you held this ramp, as one false move would send it smashing shut straight onto your fingers, which was painful for one commenter who discovered that the hard way. This water dog ramp is long-lasting and customers who had it for years claimed that it was “still going strong.” One customer’s dog had a problem getting on and off the ramp; he wouldn’t go, so she ended up having to bribe him with treats. The possible reason for that is the size of the ramp. Extended, it’s 24 inch long and quite hefty. Her dog needed time to adjust to the size and get comfortable with going up and down an incline of that length. Even though summer is over, we can still plan for swimming indoors (or if you’re down in the warmer southern climates, you're still feeling lucky). 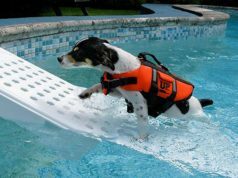 Dog owners whose pets have problems climbing out of pools may find this list of best dog ramps for water useful. Taking our dogs swimming is a great way to play and have fun together. Swimming is great for dogs. It allows them to exercise and most dogs are naturally good swimmers. If your dog is elderly or has another deficiency that makes walking, running, or on-land exercising difficult for him or her, swimming in dog pools is a nice alternative and replacement to that, as it works the joints, bones, and muscles without straining them in the same way that the pounding motion of running does. When taking your dog swimming, you might want or need to browse for the best dog ramps for water. Pet ramps work with some of the same concepts as wheelchair ramps for humans. They allow pets to get in and out of elevated places easily without strain or pain. Dog ramps for water let your canine control his or her water experience and prevent them from getting injured or slipping. 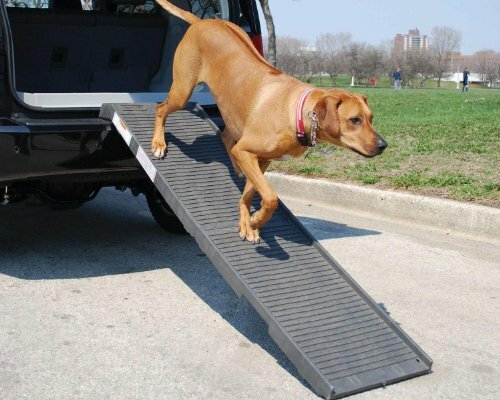 What are Dog Ramps for Water and Why Pets Need Them? Dog water ramps aren’t just for the swimming pools. These dog ramps can work for boats. Many dogs like boats and jumping out of them, but, as humans know, boats aren’t always the easiest things to get on for neither bipedal nor quadrupedal creatures. Dog ramps for water provide a platform that can make your dog’s venture onto the boat very simple and easy, and it's part of pet safety precautions. Dealing with a dog slipping is scary, and no one wants to make an emergency trip to the vet. You may need to teach your dog how to use the water ramp. Though it might seem like a no-brainer for us, dogs can be intimidated by new things and if a bright yellow ramp suddenly appears, they may not be rushing to jump on it. Consider bribing your dog along the ramp by making a trail of dog treats along it, sort of like Hansel and Gretel’s breadcrumbs, except without the terrifying ending. This way, your dog will be bribed to get on the water ramp with no problem, eliminating the headache for you. You should also, if you’re concerned about your dog’s safety, make sure he or she is attached to a dog harness (not a leash, because a simple dog leash that only goes around their neck can choke him or her if they fall off) while walking on the ramp. This way, you have control over their movements and don’t have to worry about them getting distracted by a duck in the water and lunging off the dog water ramp to get it. Dogs that are elderly or injured often feel like they are missing out, but it doesn’t have to be that way for them. They can still partake in water fun and swimming is part of dogs' DNA. Senior dogs just need a little more consideration. Elderly dogs have trouble, oftentimes, taking stairs and making their way up things, as that tends to be the most problematic way for their sore joints to move. Something like these best dog ramps for water cut that difficulty in half and can turn water fun into an easy and enjoyable experience that your elderly dog can really benefit from, as exercising in the water is good for osteoporotic or arthritic dogs. Below, the list of best dog ramps for water I've compiled contains information about various dog water ramps and lifts or dogs that you can get for your canine to make his or her transition into the water nice and smooth. Read through the overview of the product to get the full measure on whether or not it’s right for you and your pup, and see what other pet parents had to say before making any purchases. How to Select the Best Dog Ramps for Water and Pools? Selecting the best dog water ramp is really about knowing your pet and knowing the area in which you want to attach the ramp. Water ramps for dogs are not all alike, and some operate as dog lifts that simply elevate your puppy instead of having them walk up an incline or decline. Know the dimensions of the swimming pool or boat that you’ll be attaching this to and go from there. If you have a large dog, measure their weight and ensure that the dog water ramp you purchased can hold them and won’t buckle under their poundage. Since this ramp will likely be repeatedly used, you want one that can withstand that weight being placed on it on a regular interval. Water safety is all about preparedness, and ramps are the ultimate preparation. Decide whether you want a ramp or a lift as well. Ramps involve walking, so if your arthritic dog has hip dysplasia and is too large for you to carry, you may want to purchase a lift that can boost them up without them having to do any work. If you have a puppy, one of these best dog ramps for water might be necessary because puppies are too small to make the stairs. Any dog can need a ramp, in fact, as entrances that work for bipedal humans aren’t always the best for dogs. Water safety measures indicate that you should teach your dog the proper use of the dog water ramp and take it down when it is not time to swim. Accidental drowning deaths do happen and you want to avoid that at all costs. Take the ramp away so that your dog knows that it is not time to get in the water. You also might want to get a pool covering to secure the area as well. A few other pet safety tips that are vital to mention include dog water vests and what to “steer clear” from. Always keep a water vest on your dog if you are traveling on a boat. Also, the first time you go into the water together, keep a close eye on him or her, because even though dogs tend to know how to doggy-paddle, it’s not always intuitive. Once you’ve gauged his or her swimming skills, you’ll know whether to put a life vest on him or her and teach dogs how to swim. But regardless, keep a vest on them when traveling on a boat, since the water in a lake or ocean is much more treacherous than that of the backyard pool. “Steer clear” of algae, fishing equipment, or anything that isn’t identifiable and that your dog might eat. Dogs are curious—too curious for their own good sometimes—and you want to prevent them from ingesting something that can make them sick or hurt internally. My dog, Walter, frequently attempted to eat the algae from the surface of the pond in our backyard. We never took him swimming in that pond (it was gross, not at all fit for swimming); he just for some reason really wanted to try the algae. Algae is toxic for dogs, so whether he had some subconscious death wish, we don’t know, but we ended up putting a fence around the pond to protect Walter from his algae-eating urges. If your dog is like that, you should consider that approach as well, just to be safe. When it comes time to take your dog out of the water, always make sure to give him or her a good scrub-down afterwards. Chlorine residue can irritate your dog’s sensitive skin if left on there. If your dog has any open lacerations or wounds on his or her skin, consider not taking him or her into a lake or ocean. The salt will sting the wounds (ocean) and there also could be other contaminants in the water that could give your pet some problems. If you think that your dog has developed some sort of infection from the water, be sure to take him or her immediately to the vet. Above all, just keep a watchful eye on your dog whether they’re on one of these best dog ramps for water or in the water itself. Hopefully our list of bests water dog ramps has given you the info you need to ensure that your little buddy has a great time swimming or boating!